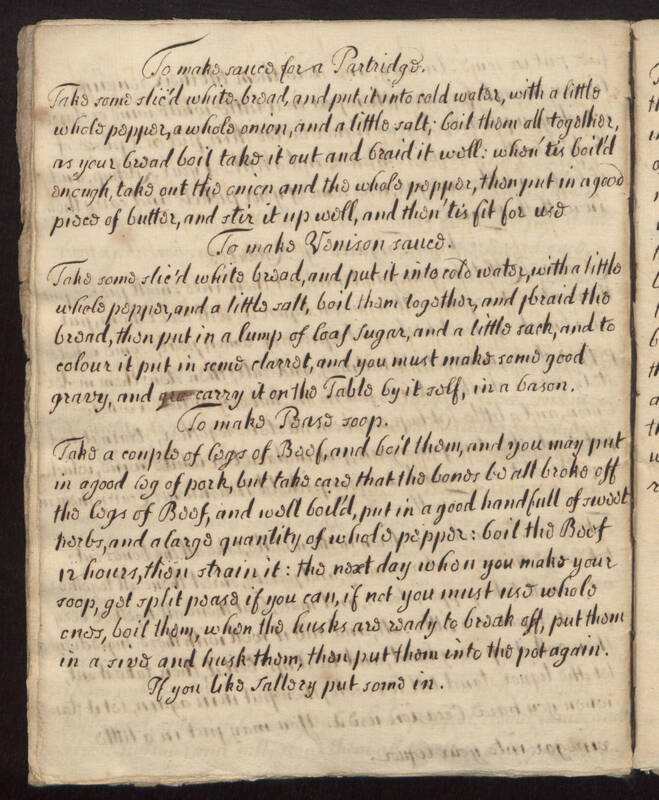 To make sauce for a Partridge Take some slic'd(sliced) white-broad, and put it into cold water with a little whole pepper, a whole onion, and a little salt; boil them all together, as your bwad boil take it our and braid it well. when' tis boil'd enough take out the onion and the whole pepper then put in a good piece of butter and stir it up well and then' tis fit for use. To make Vonison sauce Take some slic'd white bread and put it into cold water with a little whole pepper and a little salt, boil them together, and [pbraid] the brend then put in a lump of loaf sugar, and a little sack, and to colour it put in some clarrot and you must make some good gravey and carry it on the Table but is self, in a bason. To make Baso soup Take a couple of legs of Beef and boil them and you may put in a good leg of pork, but take care that the bones to all broke off this legs of beef and well boil'd put in a good handfull of sweet herbs and a large quantity of whole pepper: boil the beef 12 hours, then strain it. The next day when you make you soop, get split pease if you can, if not you must use whole ones, boil them, when the husks are ready to break off, put them in a jive and husk them, then put them into the pot again. If you like sallory [celery] put some in.